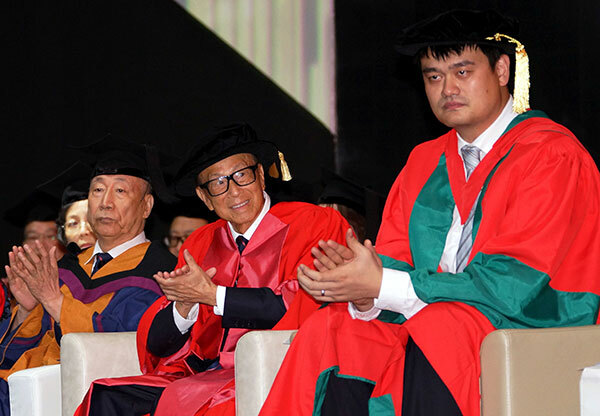 (P1) Business tycoon Li Ka-shing, Hong Kong’s richest man, attended commencement ceremonies at Shantou University on Thursday, and the speech he delivered has gone viral on social media. (P2) Sound bites from commencement speeches are usually a hot topic online during graduation season for Chinese universities every summer. (P3) Li’s speech, in the title of “The Future is Right Ahead”, is the latest click magnet. (P4) The 88-year-old told 2,161 graduates that to stand out in an era when technology empowers machines with the ability to make observations and think logically, humans need to keep on learning with a humble attitude, to be open to new ideas and to be compassionate. (P5) “We have to be on high alert to the tendency of closing up” one’s eyes and ears to new, unfamiliar ideas, said the honorary president of Shantou University Council. (P8) The Li Ka Shing Foundation has been sponsoring Shantou University since the school’s founding in 1981. Financial support from the foundation will add up to HK$8 billion ($1.03 billion) by 2018. (P9) Li has been attending commencement at Shantou University and delivering a speech for 15 consecutive years, since 2002. (P10) The foundation also invited Yao Ming, former NBA star, and creator of the Yao Foundation, to give a speech at commencement this year. (P11) Using his NBA experience as vivid examples, Yao advised graduates on setting goals, facing failure and shouldering responsibility as a team player. (P12) “Life has no rehearsals. No one can ensure you a happy ending, even if you go all-out. But we can choose the attitude to face failures,” Yao said. (P13) Yao said that he missed 3,046 field goals and had 1,304 turnovers throughout his NBA career. “All the mistakes and successes made up my complete NBA career,” he said. (P14) Zhong Hui, one of the graduates, described the commencement ceremonies this year as “stunning”. She called that Li’s and Yao’s speeches were “inspirational”. Do you agree or disagree with what Li Ka-shing spoke about? Why? Why do people make false judgments? Is failure accepted in your culture? Why or why not? What is the name of the college where Mr. Li Ka-shing spoke at? According to Li, what should people always remember? How many years in a row has Li been going to commencement at the university? Who else spoke at the ceremony? What’s the name of the student who gave a personal observation of the speeches?